Championship side Ipswich came from behind to end the Carling Cup run of League Two strugglers Northampton. Liam Davis put the visitors in front with a stunning strike from long range against the run of play. Carlos Edwards levelled 10 minutes later with a fine finish after a defensive lapse by the Cobblers. Damien Delaney put them in front from a Andros Townsend corner and a Tamas Priskin header late on made sure of Ipswich's quarter-final place. The Cobblers, who dumped Liverpool out in the previous round, went into the game languishing in 91st place in the Football League ladder and on the back of five defeats since winning at Anfield. But they looked like threatening another shock when Davis put them ahead in the 16th minute. A lovely passing move saw Billy McKay and Kevin Thornton combine to free Davis in space 30 yards from goal. The left-back was allowed to turn onto his favoured left and struck a speculative shot which dipped over Murphy's head and found the roof of the net with the aid of a slight deflection. However Ipswich, who have been on a poor run of their own, produced a professional display and levelled through Edwards. Jason Scotland powered through a flimsy challenge, Davis crucially lost his footing and Edwards hammered a fine drive past Dunn and into the top corner. The hosts stepped it up a gear and keeper Dunn had to parry a stinging Grant Leadbitter shot around the post for a corner. From Townsend's centre Delaney reacted brilliantly to hammer in the loose ball past Dunn at his near post. Michael Jacobs had a rare chance for the visitors when he intercepted Leadbitter's poor pass but the teenager - who had scored at Liverpool - lost his composure to fire wildly over the top. Ian Sampson's side threatened late on but when Priskin flicked in a header from Leadbitter's curling free-kick their brave challenge came to an end. "We're hopeful of a home tie. Our priorities are the league on Saturday but I don't complain about winning football matches. "We started well but the big boys are flexing their muscles now and the semi-finals are a long way off. "People think I'm doom and gloom but you look at Cardiff last night and we are a world away from that. "We are miles away from the likes of Cardiff and QPR and people need to realise that. I appreciate my glass is always half empty but that is the reality." "I did think it was going to be another one of those nights when we scored and that's only natural. "It was a bit lucky with the deflection but you do start dreaming. It was maybe a bit early to go ahead but Ipswich's class shone through in the end. "We've got bigger fish to fry now. If they keep believing in each other we will be OK and I am confident that we can get out of the predicament we are in the league. "It has been a great cup run. The win at Liverpool will live long in the memory for everyone connected with the club. But livelihoods depend on results at this club now and it is time to put that right." 90:00+4:39 The match has reached full-time. 90:00+3:41 Foul by Andrew Holt on Grant Leadbitter, free kick awarded. Free kick taken by Brian Murphy. 90:00+1:58 Substitution Carlos Edwards leaves the field to be replaced by Jamie Griffiths. 89:44 Tommy Smith takes a shot. Craig Hinton gets a block in. 87:11 Foul by Craig Hinton on Ronan Murray, free kick awarded. The assist for the goal came from Grant Leadbitter. 87:11 GOAL - Tamas Priskin:Ipswich 3 - 1 Northampton Tamas Priskin finds the back of the net with a headed goal from close in. Ipswich 3-1 Northampton. 81:49 The official flags Billy Mckay offside. Indirect free kick taken by Brian Murphy. 80:40 Billy Mckay has an effort at goal from outside the box which goes wide right of the target. 79:47 Inswinging corner taken right-footed by Grant Leadbitter, clearance by Ryan Gilligan. 78:44 Michael Jacobs produces a cross, Carlos Edwards makes a clearance. 77:37 Marcus Hall concedes a free kick for a foul on Ronan Murray. Grant Leadbitter takes the indirect free kick. 75:27 Centre by Ryan Gilligan, save by Brian Murphy. 74:09 Centre by Carlos Edwards. 72:21 Ronan Murray has an effort at goal. Chris Dunn makes a comfortable save. 67:57 Substitution Andrew Holt replaces Kevin Thornton. 66:07 Substitution Jason Scotland goes off and Ronan Murray comes on. 66:07 Substitution Jaime Peters comes on in place of Andros Townsend. 64:44 Jason Scotland takes a shot. Blocked by Craig Hinton. Tamas Priskin takes a shot. Chris Dunn makes a save. 62:31 Effort from just outside the box by Michael Jacobs goes over the bar. 61:05 Abdul Osman gives away a free kick for an unfair challenge on Andros Townsend. Indirect free kick taken by Grant Leadbitter. 60:25 Free kick awarded for a foul by Tamas Priskin on Liam Davis. Indirect free kick taken by Chris Dunn. 59:33 Paul Rodgers sends in a cross. 58:33 Andros Townsend takes the chance to get an effort at goal. Save by Chris Dunn. 55:16 The assistant referee flags for offside against Kevin Thornton. Indirect free kick taken by Brian Murphy. 54:21 Foul by Marcus Hall on Jason Scotland, free kick awarded. The free kick is delivered left-footed by Andros Townsend from right channel, Chris Dunn makes a save. 53:34 The ball is delivered by Andros Townsend. 52:29 The ball is delivered by Andros Townsend, Marcus Hall manages to make a clearance. 50:02 Outswinging corner taken left-footed by Andros Townsend from the left by-line, clearance by Kevin Thornton. 48:39 Effort on goal by Damien Delaney from outside the area goes harmlessly over the bar. 48:09 Corner taken by Andros Townsend, Ryan Gilligan makes a clearance. 47:38 Centre by Andros Townsend, blocked by Ryan Gilligan. 47:13 Outswinging corner taken from the right by-line by Grant Leadbitter. 46:56 Tamas Priskin takes a shot. Liam Davis gets a block in. 45:00+4:12 The whistle is blown to end the first half. 45:00+3:15 Andros Townsend sends in a cross, Tamas Priskin takes a shot. Chris Dunn makes a save. 45:00+1:42 Foul by David Norris on Kevin Thornton, free kick awarded. Free kick crossed left-footed by Liam Davis, Carlos Edwards makes a clearance. 44:45 Michael Jacobs produces a cross. 43:05 Corner taken by Andros Townsend from the left by-line, Andros Townsend provided the assist for the goal. 43:05 GOAL - Damien Delaney:Ipswich 2 - 1 Northampton Goal scored by Damien Delaney from inside the penalty area to the top left corner of the goal. Ipswich 2-1 Northampton. 42:17 Grant Leadbitter takes a shot. Save made by Chris Dunn. David Norris delivers the ball. 40:05 Tamas Priskin gives away a free kick for an unfair challenge on Liam Davis. Liam Davis takes the free kick. 36:56 Tom Eastman sends in a cross, clearance by Marcus Hall. 36:29 Abdul Osman produces a cross, save by Brian Murphy. 35:52 Free kick awarded for an unfair challenge on Grant Leadbitter by Abdul Osman. Indirect free kick taken by Grant Leadbitter. 31:37 Corner from left by-line taken by Andros Townsend. 28:30 Tamas Priskin takes a shot. Save by Chris Dunn. 25:18 Jason Scotland provided the assist for the goal. 25:18 GOAL - Carlos Edwards:Ipswich 1 - 1 Northampton Goal scored by Carlos Edwards from inside the penalty area to the top left corner of the goal. Ipswich 1-1 Northampton. 24:35 Carlos Edwards produces a right-footed shot from outside the box and misses left. 22:26 The ball is crossed by Liam Davis. Free kick awarded for a foul by Billy Mckay on Tom Eastman. Brian Murphy restarts play with the free kick. 21:27 Tamas Priskin is flagged offside by the assistant referee. Marcus Hall takes the indirect free kick. 19:57 The ball is sent over by Carlos Edwards, clearance made by Craig Hinton. 17:28 Tamas Priskin is caught offside. Indirect free kick taken by Chris Dunn. Correction - 16:00 The assist for the goal came from Kevin Thornton. Correction - 16:00 GOAL - Liam Davis:Ipswich 0 - 1 Northampton Liam Davis scores a goal from long range high into the middle of the goal. Ipswich 0-1 Northampton. 15:51 Assist on the goal came from Kevin Thornton. 15:51 GOAL - Liam Davis:Ipswich 0 - 1 Northampton Liam Davis finds the net with a goal from long distance high into the middle of the goal. 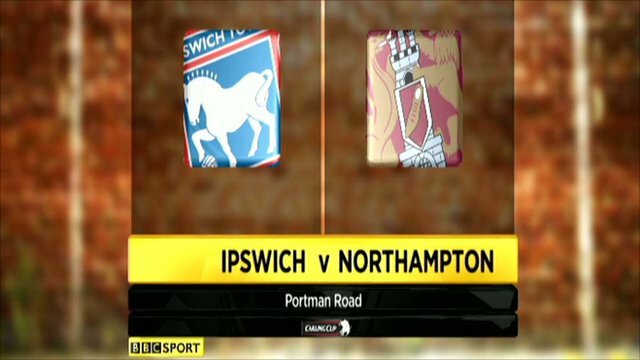 Ipswich 0-1 Northampton. 14:54 A cross is delivered by Tom Eastman, Kevin Thornton makes a clearance. 14:12 Shot from just outside the box by Tommy Smith goes over the crossbar. Correction - 13:22 Unfair challenge on Andros Townsend by Nathaniel Wedderburn results in a free kick. Grant Leadbitter takes the free kick, Carlos Edwards produces a cross, Craig Hinton makes a clearance. Grant Leadbitter sends in a cross. 13:22 Free kick awarded for a foul by Nathaniel Wedderburn on Andros Townsend. Grant Leadbitter restarts play with the free kick. 10:53 The ball is sent over by Andros Townsend, clearance made by Craig Hinton. 9:30 The ball is swung over by Paul Rodgers. 8:37 Shot from just outside the box by Andros Townsend goes over the target. 7:55 Tamas Priskin has a drilled shot. Chris Dunn makes a save. 6:35 Outswinging corner taken from the left by-line by Andros Townsend, The ball is sent over by Carlos Edwards, Paul Rodgers makes a clearance. 5:34 Outswinging corner taken by Grant Leadbitter from the right by-line played to the near post, clearance made by Michael Jacobs. 5:15 Effort from 25 yards by David Norris. Blocked by Craig Hinton. Correction - 4:34 Kevin Thornton takes a shot. Brian Murphy makes a save. 4:34 Shot by Kevin Thornton. Save by Brian Murphy. 4:00 The official flags Gareth McAuley offside. Chris Dunn takes the free kick. 3:41 The ball is swung over by Damien Delaney, clearance made by Nathaniel Wedderburn. 1:52 Carlos Edwards delivers the ball, clearance by Craig Hinton.